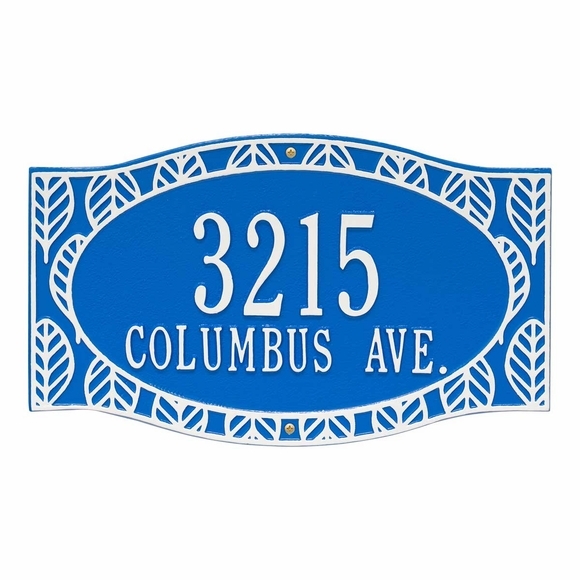 Coastal Style Address Plaque with House Number & Street Name - - two line wall plaque with tropical appeal. Personalized with the address you supply and the color combination you select. Custom made in the USA. Inspired by the leaf of a palm or fern, the detailed fronds on this plaque invokes the breezy feeling of a beautiful beach or coastal location. House number line holds up to six (6) 3" characters. Street name line holds up to thirteen (13) 1.25" characters. Dazzling blue with white characters (C8) is shown in the large image. The other 17 colors are shown from left to right in small images: AB antique brass; AC antique copper; BG black with gold characters; BS black with silver characters; BV bronze verdigris; BW black with white characters; C9 scuba blue with white characters; DW dark blue with white characters; GG green with gold characters; L7 stucco with magenta characters; M1 white with aruba blue characters; OB oil rubbed bronze; OG bronze with gold characters; PS pewter with silver characters; RG red with gold characters; WG white with gold characters; and WH white with black characters. Dimensions: 15.25"W x 9.125"H x 0.25. A one-line version of this sign with just the house number is also available. Click top link in Related Products. Address shown in images: 3215 Columbus Ave.